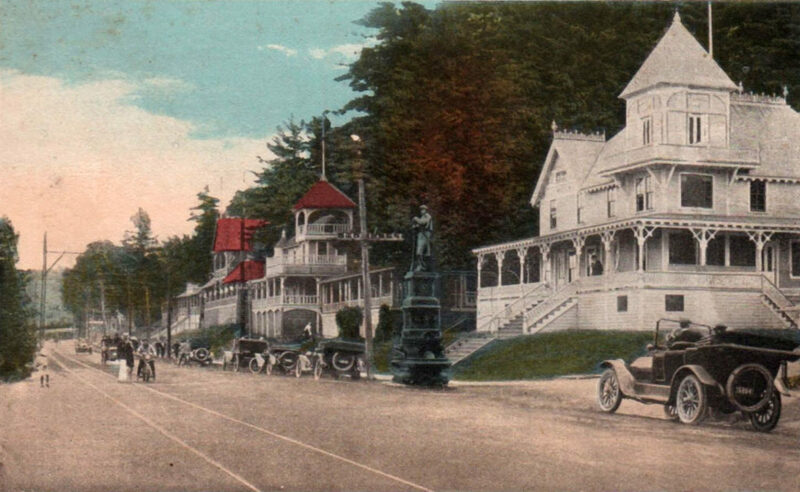 In early 1861, Loammi Bean purchased the 150 acre Nestledown Farm in Weirs Beach, which later became “The Plantation House”, a hotel accommodating 68 guests, and still later, the site of today’s housing developments on and around Pendleton Road, off Route 11B. In July, 1861, Loammi enlisted in the 8th New Hampshire Volunteer Regiment. He was 37 years old. 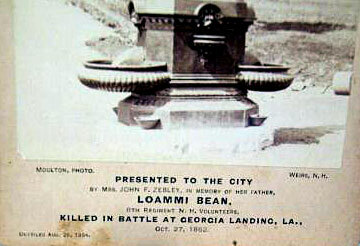 On October 27, 1862, he was was one of the first casualties at the Battle of Georgia Landing in Louisiana. 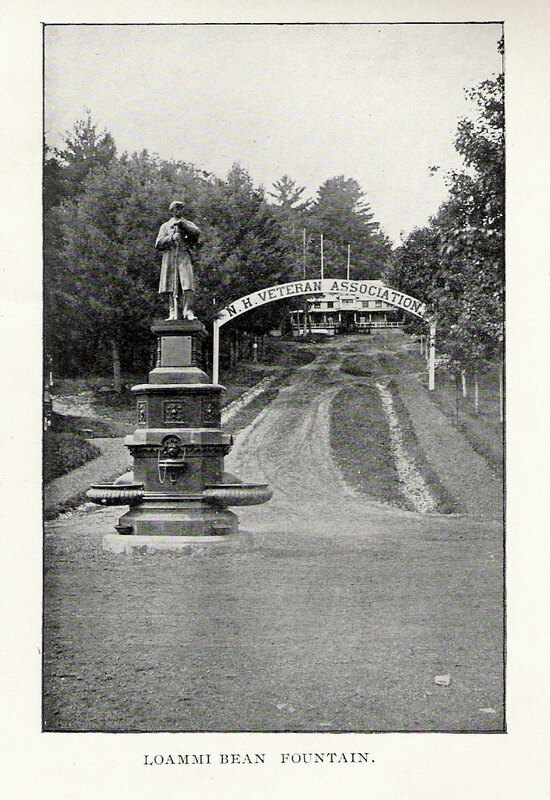 His daughter, who became Mrs. John F. Zebley, erected this monument in his honor, and in tribute to “the memory of the thousands of other gallant soldiers who laid down their lives so that the Union might be preserved.” The statue was dedicated August 29, 1894. It was destroyed by lightning on July 23, 1931. 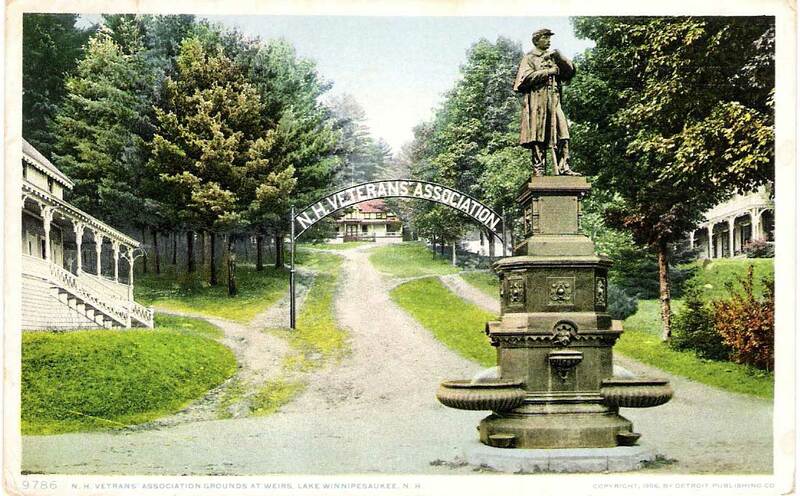 More than 80 years later, the statue’s dedication plaque was located in a basement, and first reappeared to the public at an exhibit of NH Veterans history, organized by the Laconia Historical Society, and displayed at the Laconia public library. Helen Szafer, an expert on memorial fountains, has written an excellent article about the fountain here. Below, various views of the fountain. 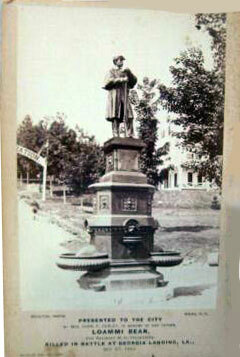 The statue was not only a memorial, it was a working water fountain. 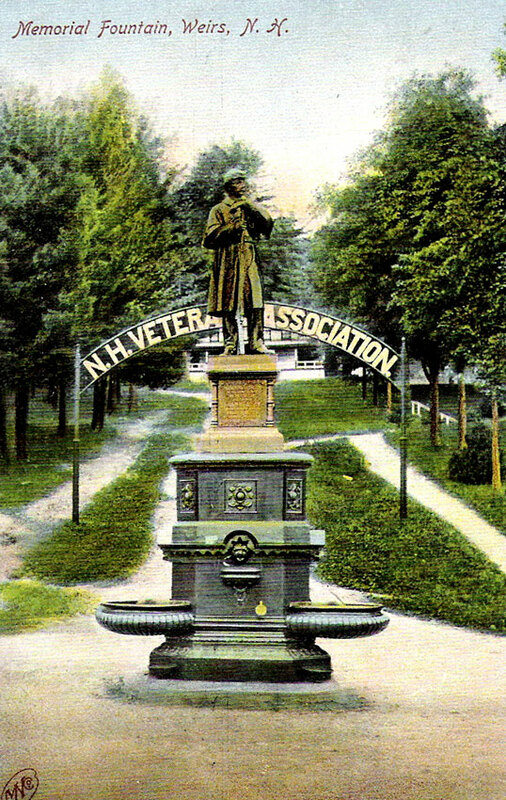 Two troughs, facing North and South, were at just the right height to keep the carriage horses well watered, while two spigots, placed higher up on the statue and facing East and West, were available to quench a person’s thirst. Click here for some additional views of the statue. 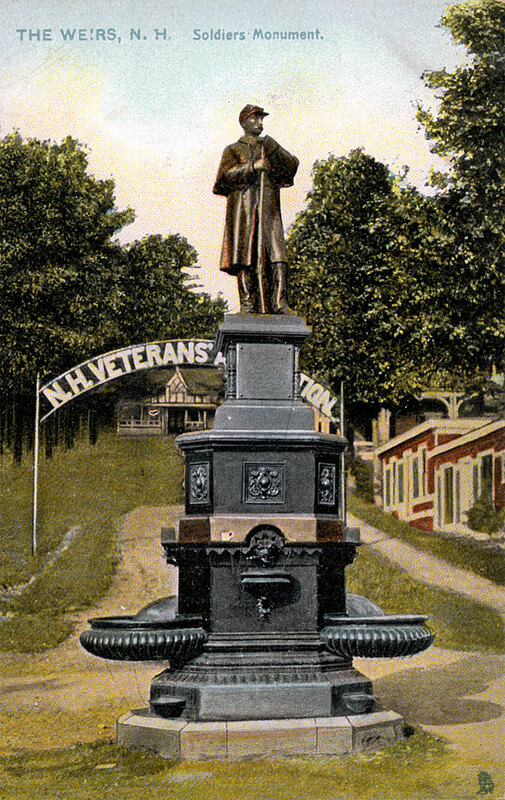 The original postcard issued at the statue’s dedication. 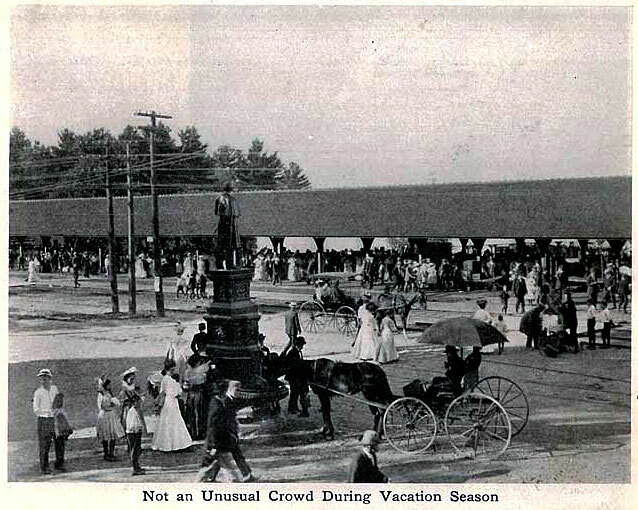 Well past the age of horses and carriages, the statue still stood proudly at the center of Lakeside Avenue, even when automobiles had made the watering trough part of the statue long obsolete. 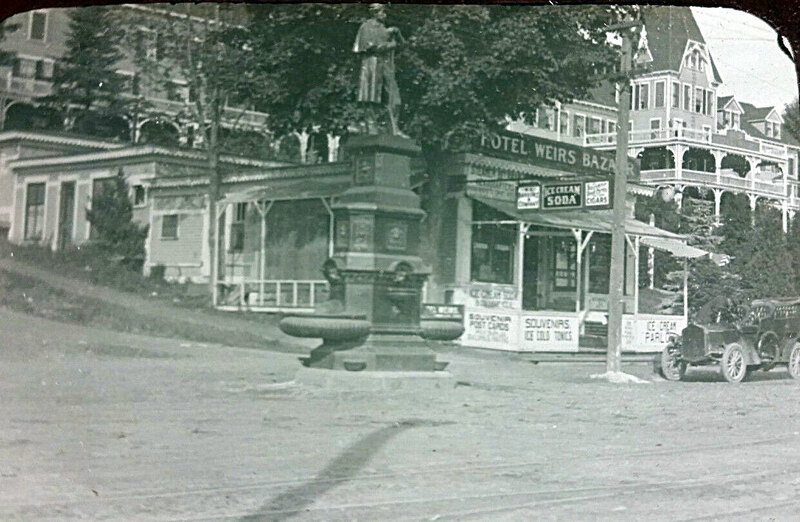 Here, a motorcyclist pauses on Lakeside Avenue near the statue.